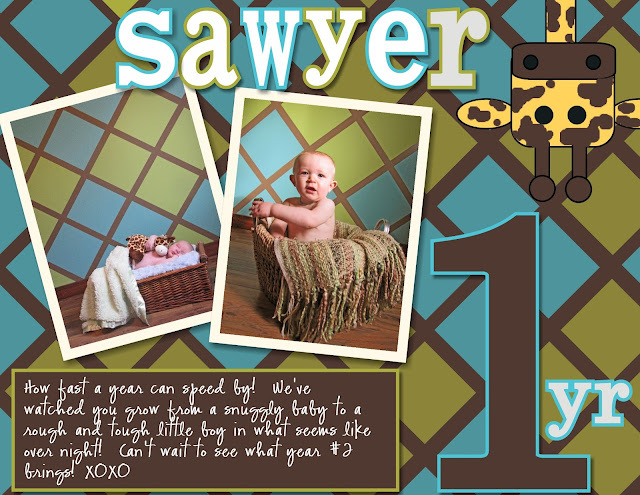 Something a little different on the menu today - a digital scrapbook page! This was one of three scrapbook page entries I submitted for the Artisan Awards. I must say scrapbooking has never been my cup of tea; which you've probably figured out if you follow my blog. I always feel like I'm stuck in a design rut when I try to design a page - for me designing and creating cards is just so much easier for some reason! However, when I enter into the world of My Digital Studio, all that design rut stuff melts away. Maybe its because I'm in the generation of techies but all the sudden ideas start flowing and the mouse starts clicking and viola, I've created a scrapbook page I actually LIKE! The inspiration for this page was my youngest son's bedroom feature wall. I had this crazy idea when I was pregnant (ok, I'll admit I'm guilty of crazy ideas even when not pregnant...) that I wanted a plaid theme in his bedroom. Most folk would probably buy bedding and sheets in plaid and call it a day but I dream oh so much bigger! I somehow convinced my husband that painting a wall to look like plaid would be "SO NEAT". Well, I was right! (but really, was there any doubt?) I'm not sure how much he cursed me while taping and painting, then taping and painting, then taping and painting but it looks spectacular. I used the wall as a backdrop when I took photos of him at about 10 days old, then again on his first birthday. I'm going to attempt taking one at his second birthday in a few months - although I have a feeling it may be an action shot! · This group of 4 squares was then copied and pasted until the entire background of the project was full, aligning the sections as they were added. Each section was then paper filled by alternating Lucky Limenade and Tempting Turquoise. · Photos were added along with a frame to each in Whisper White. A drop shadow was also added to each photo. · Lettering was done with the punches from the Timeless Type Junior letters. Each punch was paper filled with Whisper White and a frame added to each punch alternating between Lucky Limenade and Tempting Turqouise colors. A drop shadow was added to each element. · The #1 was done with the punches from the Timeless Type Junior Numbers. It was filled in Chocolate Chip and framed in Tempting Turqouise. The “yr” was done in the same manner, just filled with Whisper White. A drop shadow was added to each element. · Nose is also a Rounded corner punch paper filled with Chocolate Chip and framed in Basic Black. This layer is brought forward when positioned at the bottom of the head. · Nostrils and Eyes are the Circle punch in Basic Black. · Antenna’s were first created with a square punch paper filled with Chocolate Chip and outlined in Basic Black. I sent this layer to the back to hide the join where they meet the top of the head. The circles on top of the antenna’s are made with the circle punch paper filled with Chocolate Chip, outlined in Basic Black and the layer brought forward to rest on top of the rectangular piece of the antenna. · Ears are created with the Oval punch paper filled with So Saffron, framed with Basic Black. The layers were sent to the back so they would appear tucked behind the head. · The neck is the square punch paper filled with So Saffron and framed in Basic Black. The layer was sent to the back so it appears to be behind the head. · To create the spots the Freeform tool was used. A brush layer was added over all the So Saffron areas using the Circle style function in Chocolate Chip. I've also used a similar technique to create the giraffe in my son's first birthday invitation, which you can see HERE. And remember, if you've been on the fence as to whether to try the MDS software or not, you can try it for free by clicking on the My Digital Studio trial icon in the left hand sidebar. If you have any questions, please don't hesitate to leave a comment or email me! Hope you enjoyed this slight change up! 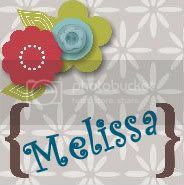 I'd love to hear your thoughts on the digital scrapbooking - do you love it or are you a traditional scrapper? What a great layout. I love how your husband painted and taped and painted and taped. What a beautiful outcome. Your son is so cute too.